Together these two companion volumes develop an innovative theory of world politics, grounded in the reinterpretation of the concepts of ‘world’ and ‘politics’ from an ontological perspective. Ontology and World Politics presents a new approach to political universalism, grounded in the reinterpretation of world politics from an ontological perspective. In the discipline of International Relations the concept of world politics remains ambivalent, functioning both as a synonym of international relations and their antonym, denoting the aspirations for the overcoming of interstate pluralism in favour of a universalist politics of the global community or the world state. 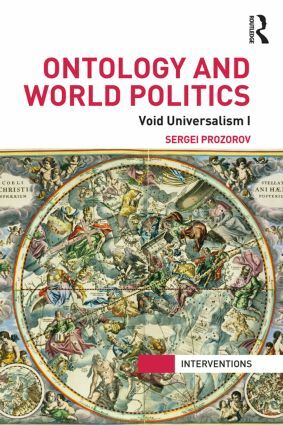 Rather than distinguish ‘world politics’ from ‘international politics’ by its site, level or issues, Prozorov interprets it as another kind of politics. Drawing on Martin Heidegger’s account of world disclosure and Alain Badiou’s phenomenology of worlds, this book posits world politics as a practice of the affirmation of universal axioms across an infinite plurality of limited and particular situations or ‘worlds’. Prozorov reinterprets the familiar principles of community, equality and freedom in ontological terms as attributes of pure being, subtracted from all positive determinations, and presents them as axioms of universalist politics valid in any world whatsoever. This approach to world politics serves as the groundwork for a comprehensive reconsideration of the central themes of political and international relations theory. Systematic and accessible, these works will be key reading for all students and scholars of political science and international relations. Part II: What is world politics?